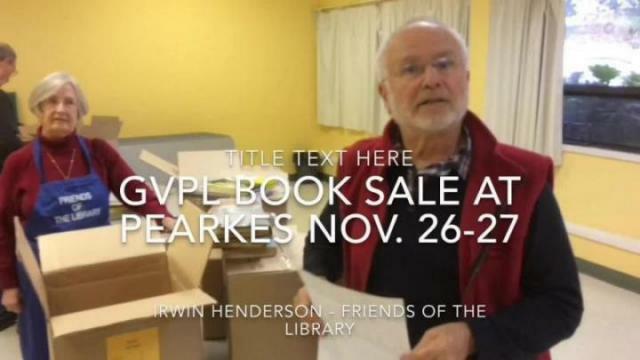 You can stock up on as many books as you can carry for $10 Sunday afternoon at the Friends of the Greater Victoria Public Library’s Giant pre-holiday book sale. The volunteer group has collected 900 boxes worth of novels, kids books, cooking, gardening, travel, non-fiction, CDs, DVDs and more for the sale that goes Saturday and Sunday in the field house of Pearkes Recration Centre. The sale starts with an early bird entry on Saturday from 1 to 5 p.m. with a $5 admission and nominal prices on books. Sunday morning from 9 a.m. to 1 p.m. is free admission, while later on Sunday, from 1:15 to 3:15 p.m. a $10 entry fee gives patrons the chance to take away as many remaining books as they’d like. The Friends of the Library use the money to run programming throughout the year and to purchase other items including audible books for people who are visually impaired. Some money has gone to the GVPL’s mobile library van. “We have three sales a year but this is our biggest, we pull in about $5,000 to $7,000,” said volunteer Irwin Henderson. The books are donated to the libraries throughout the year and are coupled with those books no longer fit for circulation in the GVPL system, often from wear and tear or redundancy. Those wishing to donate books can drop them off at Pearkes Rec Centre Friday from 8 a.m. to 5 p.m. and Saturday from 8 a.m. to 1 p.m..
For more information visit GVPL.ca.